380 pages | 338 B/W Illus. This book focuses on the basic principles of digital electronics and logic design. It is designed as a textbook for undergraduate students of electronics, electrical engineering, computer science, physics, and information technology. The text covers the syllabi of several Indian and foreign universities. It depicts the comprehensive resources on the recent ideas in the area of digital electronics explored by leading experts from both industry and academia. A good number of diagrams are provided to illustrate the concepts related to digital electronics so that students can easily comprehend the subject. Solved examples within the text explain the concepts discussed and exercises are provided at the end of each chapter. 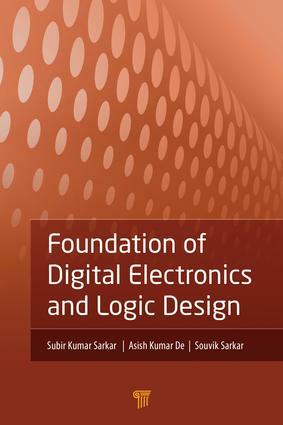 "This book is a comprehensive work by the authors that provides an understanding of the basic principles of digital electronics and logic design. It describes the functioning of digital circuits, both combinational and sequential, in detail. It also introduces the functioning of modern digital circuits in a simple manner, and problems are worked out for ease of understanding. As a textbook, it will benefit the student pursuing a first course in electrical or computer engineering." "This book has been excellently written to bridge the gap between theory and practice and to develop the prototype to showcase the talents. The presentation of the book is lucid with adequate figures, tables, and examples. The chapters on logic families, memories, and analog-to-digital and digital-to-analog converters will be useful for postgraduate students as well. Overall, I rate it a very good book." Grey code and binary to Grey code conversion. Multiplexers design procedure and applications. Decoder driver IC and its function and its cascading for multiple digit display. Different types of Flip-Flops and their application. Subir Kumar Sarkar is professor in the Department of Electronics and Telecommunication Engineering, Jadavpur University, West Bengal, India. He has published five textbooks on engineering and more than 480 technical research papers in archived international and national journals and peer-reviewed conferences. Prof. Sarkar is a senior member of the IEEE; life fellow of the Institute of Engineers, India, and the Institution of Electronics and Telecommunication Engineers, India; and life member of the Indian Society for Technical Education and the Indian Association for the Cultivation of Science. Asish Kumar De is associate professor in the Department of Electronics and Communication Engineering, National Institute of Technology, Durgapur, India. He has published around 20 research papers in archived international and national journals and peer-reviewed conferences. His research interests include nanodevice simulation and modeling and application of soft computing tools in device modeling. Prof. De has 10 years of research experience and has been teaching for more than 26 years. Souvik Sarkar obtained his ME and PhD in engineering from Jadavpur University. He is an application consultant at IBM Global Business Services, India. He has published around 25 research publications in archived international and national journals and peer-reviewed conferences.